The Stone for Lord Kuro Incense in Sekiro is a plot-critical item you’ll have to find in the game. The Shelter Stone in Sekiro, as it’s called, is a necessary ingredient for a concoction you’ll need very close to the end of the game. But, only if you make the “right” choice at a crucial junction. All that said, welcome to our Sekiro Stone For Lord Kuro Incense Location guide will show you how to get the Shelter Stone, exactly where to find it, and how to use it. Before you go any further, though, we’re gonna have to put up a huge ole SPOILER WARNING. We’re gonna be discussing some fairly late-game content. If you haven’t at the very least fought Genichiro again, bookmark us and come back later. How to Get Stone for Lord Kuro Incense in Sekiro? To get the Stone for Lord Kuro incense in Sekiro, you’ll have to explore the deep recesses of Mibu Village. As you go through the place, you’ll come across a long, narrow, wooden bridge. The ghost of a samurai is going to attack you about halfway, and that’s how you’ll know that you’re on the right way. Climb up the stairs, and follow the road uphill. When you come across a house besieged by monsters, head to the left and through the doorway. You’ll come across a huge, sheer cliff wall, and a ghostly Corrupted Monk will attack you. After you manage to kill the Corrupted Monk ghost, you’ll get the Dive skill, which will allow you to stay underwater indefinitely. Then, proceed through the stone doorway next to the Wedding Cave Door idol. Follow the path until you find yourself in a huge hall. In front of you, you’ll see a small altar, upon which the Stone rests. Pick it up, and continue on your quest. Incidentally, this whole thing only starts after you speak to Kuro, Isshin, and Kuro again after you defeat Genichiro. Also, if you don’t abandon the Iron Code when asked by the Shinobi Owl, this questline becomes impossible to complete. Where to Find Shelter Stone for Sekiro Lord Kuro’s Incense? To find the Shelter Stone in Sekiro, which you need for Lord Kuro’s Incence, you’re going to have to get to Mibu Village. You can get there from the Ashina Depths. If you don’t know where that is, you can reach it through the Abandoned Dungeon. The entrance to there is past the Lone Shadow Longswordsman in Ashina. Head through the area, kill the Shichimen Warrior boss, and grapple up onto the ledge beyond. This will take you to the Bottomless Hole idol. Go to the edge of the pit and jump in. Be prepared to use the Grappling Hook to catch yourself onto a ledge. Climb up the cliff, and proceed into Ashina Depths and the Poison Pool idol. Kill the hell out of the Snake Eyes Shirahagi boss, and go into the cavern on the right, following the trail of blood. You’ll come across the Guardian Ape’s Burrow. Kill the ape, and rappel up to the cliff. Continue through the cave until you get out. From here, the path towards Mibu Village is pretty straightforward. That does not mean easy, though. There’ll be platforming across branches, scaling cliff walls, boss battles, the works. Good luck. 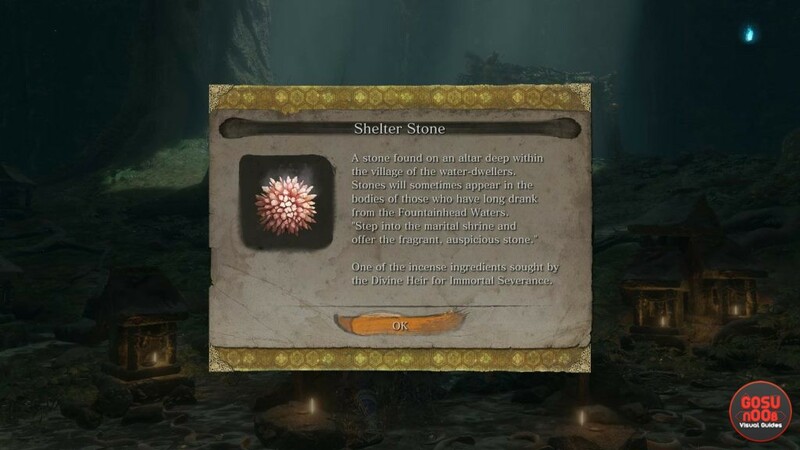 How to Use Sekiro Shelter Stone? To “use” the Shelter Stone item in Sekiro, you simply have to take it back to Lord Kuro. That’s basically all there is to it; you can’t use it for anything else, as far as we can tell. All it is is a seemingly innocuous item that doesn’t have an immediately-obvious use. This is especially true if you’ve gone for the Shura ending. The Shelter Stone is one of the ingredients for the Incense, the other being The Flower and Kuro’s Blood, for which you need to get the Mortal Blade first. If you need help finding that, check out our Sekiro Mortal Blade Location – How to Get guide. kuro has no dialogue option about the stone , anyone know how i get it ?